The Weekend Forex Gap is one of the most robust and profitable setups to trade in the Forex markets, with most gaps typically filled within 24-48 hours of the Monday ‘open’. Take a look at the 5 minute chart of Euro currency below and note how the 50 pip gap down on the Monday open is filled within the following 12 hours. Nimble short term traders are fading these gap moves with high winning percentages. It’s important to use wide stop loss orders when trading Forex gaps as there can be significant negative excursion before the gap closes, indeed not all gaps are filled. Position size should be reduced accordingly to accommodate the wider exit point. Stop losses should be adaptive to recent market volatility (higher volatility = wider stops). 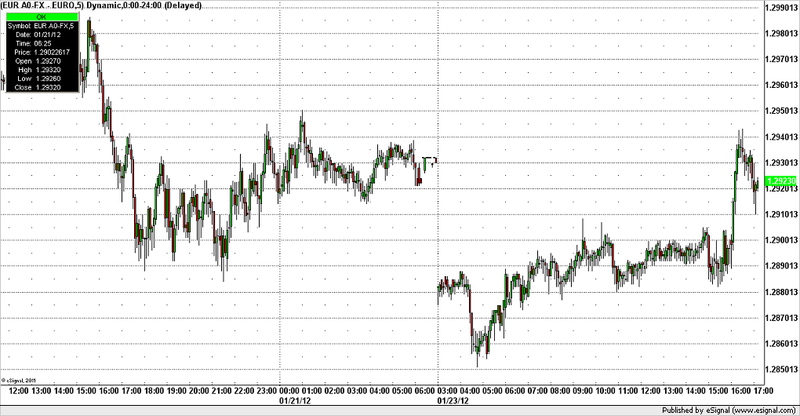 You can measure Volatility in the Forex markets using the ATR (Average True Range) Indicator. Remember the tighter your stop, the more likely it is that you will be stopped out. It’s possible to increase your winning percentage on the Weekend Gap play by using profit taking targets at percentages of a gap being closed. Some traders will exit half their position at 50% closing of a gap with the remaining position gunning for a full gap close. When trading Weekend Gaps it’s important to pay attention to bid / offer spreads which can be wide during the Sunday evening opening. Only the most liquid currencies should be considered when trading weekend gaps: EUR/USD, GBP/USD and USD/JPY etc.